Myron Aune, 60, of Mandan, passed away July 4, 2018. Mass of Christian Burial will be held at 1:00 PM on Tuesday, July 10, 2018 at St. Joseph Catholic Church, Mandan, ND with Rev. Josh Waltz as celebrant and Rev. Jarad Wolf and Rev. Shane Campbell as concelebrants. Myron “Skip” LaVerne Aune was born on August 8, 1957 at Stanley, North Dakota to Donald and Shirley (Pappa) Aune. Myron had 3 sisters and 1 brother: Dawn Jeanine, Cheryl Rae, Collette Kay (deceased); and Scott Thomas. 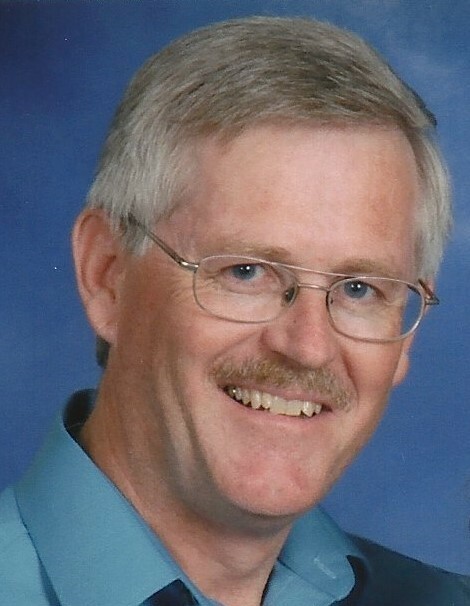 Myron graduated from Stanley High School in 1975 and received a Bachelor of Science degree in Agricultural Economics and Animal Sciences from North Dakota State University, Fargo, ND. His lifelong career in agricultural finance began in Williston, North Dakota, working for the Federal Land Bank Association of St. Paul in 1980. Myron Aune and Karla Luick were married on August 18, 1984 at her home town of Fairmount, North Dakota. They became the parents of four wonderful children: Brandon Richard; Renae Kathryn; Devin Eugene; and Sara Elizabeth. Myron was also the proud and happy grandfather to Sybil Vijayakumar Aune, who was born on December 29, 2016 to Brandon and Durga. Following wherever “the job” led them, Myron and Karla and their family lived in Williston, North Dakota, Miles City, Montana, Sidney, Montana, Lamar, Colorado (including a special credits assignment in Three Rivers, Michigan), and finally to Mandan, ND in 1997, where the couple has resided ever since. Myron had worked for over ten years at Capital Credit Union, where he put his heart into helping farmers and business folks; he also enjoyed his co-workers very much. Myron enjoyed many past-times, including his love of being involved in the sports and other activities of his children, working on old cars, hunting, fishing, boating, camping, reading, playing guitar and singing (he was a member of the St. Joseph’s Church choir for several years). But what he most loved doing was looking at, working with, riding, and talking about horses! After looking for many years for that special place - a farm home with some acreage - Myron finally realized that dream in August, 2011 when he and Karla purchased their home south of Mandan. And then the fun really began for this hard-working cowboy! He would ride 2-4 horses whenever he could after work and weekends, and Myron seemed to love every minute with them (except for a few times when, as he explained it, he was “prematurely unhorsed”)! Myron had a sense of humor that made folks laugh day after day, year after year; but he was also the most kind-hearted, honest, and sincerely Christian man we will ever know, as well as the very best husband and father ever. Myron is survived by his wife of 33 years, Karla, and their children: Brandon (Durga) Aune, Renae Aune, Devin Aune, and Sara Aune; his granddaughter, Sybil; his father and stepmother, Donald and Delphine Aune; sisters, Dawn (Dave) Rayburn and Cheryl (Danny) Holbert; and brother, Scott (Lyda) Aune; stepbrothers/sisters, Rick (Anna) Gerwien), Yvonne (Ronnie) Gunderson, Sandy (Tim) Christianson, and Ronnie Gerwien; uncles, Allen Aune and Robert (Loretta) Pappa; aunts, Sharon (Lyle) Holland, Sandy (Gary) McGinnity, Denise (Ron) Banks, and Debbie Pappa; along with many nieces, nephews, great-nieces/nephews, and cousins. Myron is preceded in death by his mother, Shirley (Pappa) Aune; sister, Collette Aune, his maternal and paternal grandparents, a brother-in-law Joseph Cotton, a cousin, T. J. Pappa, and by uncles Clayton and Ardell Aune and uncles Bill, Melvin “Mick” and Dale “Butch” Pappa. Myron loved all of his family and was especially close to beloved uncles and aunts who taught him many things about and instilled in him a great love for horses. Our loss is truly Heaven’s gain. In lieu of flowers, memorials may be designated to Pappa Memorial Roping.